St. Mary Magdalene stood weeping by the tomb, and when she was asked why she wept, she said to them, “Because they have taken away my Lord, and I do not know where they have laid Him.” (Jn. 20: 13). She did not see the empty tomb as proof of Christ’s resurrection, but rather as a confirmation of what the chief priests ordered the soldiers to say, “His disciples came at night and stole Him away while we slept.” (Matt. 28: 13) At the beginning, Mary Magdalene did not recognize our Lord Jesus Christ, but took him for the gardener and repeated the same words. But when she recognized Christ and realized the reality of the resurrection, she was joyful and hurried to proclaim it to the disciples. 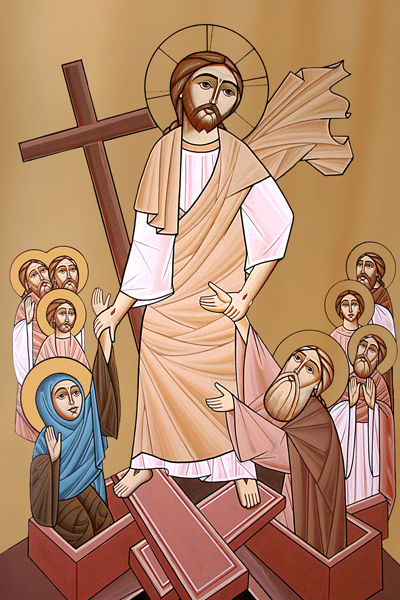 Today, we rejoice in the resurrection of our Lord Jesus Christ, because we rejoice that the Lord is at hand. Christ’s resurrection is not just a historical event, but it is a living experience. Our Lord Jesus Christ rose from the dead and raised us with Him, and we experience death and resurrection with Christ through Holy Baptism. After St. Paul’s conversion and baptism, he said, “I have been crucified with Christ; it is no longer I who live, but Christ lives in me.” (Gal. 2:20) Likewise, we also join St. Paul in saying the same thing. The Lord is at hand, because He lives in us. The Lord is at hand. It is a miraculous phrase, which grants us power to face difficulties. When David the Prophet faced heavy tribulations, he cried to God saying, “My God, My God, why have You forsaken Me?” (Ps. 22:1) and “O my God, I cry in the daytime, but You do not hear; and in the night season and am not silent.” (Ps. 22:2). That is why David asked God, “Be not far from me, for trouble is near; for there is no helper.” (Ps. 22: 11) Likewise, at times of trouble, we also make the same request. Let us rejoice, because our Living and Risen Christ is at hand, accepting our repentance and granting us forgiveness of sins. He wipes the tears of the suffering and defends the oppressed, protecting us by His mighty hand. Let us pray for the peace of the Holy Catholic and Apostolic Church. Let us pray for the families of our martyrs in Libya and Egypt, as well as for all those suffering and troubled. Let us pray for our countries: the United States and Egypt, and we pray that peace prevails everywhere worldwide. Let us rejoice in the Resurrection of our Beloved Savior, Who is at hand, because He lives in us and we in Him.